Given our program's reputation of academic excellence, it is all too easy for familes to think of us as "that school for kids who are good at math and science". It couldn't be further from the truth. BASIS Independent Brooklyn students are artists, musicians, linguists, skateboarders, athletes, dancers and more. They all just happen to be part of a well-rounded, accelerated learning environment. Not only do we value all disciplines equally, but as a program rooted in the liberal arts, we teach the full spectrum of liberal arts with the fervor and depth seen in an advanced math or science class. Did you know that our students take performing arts beginning in PreK? As a mandatory part of our curriculum from PreK- grade 4, students are given the option to dive even deeper in to the performing arts with a daily elective option starting in 6th grade. Many of these classes take place in our brand new 300 seat theater. What is the purpose of the drama program at BASIS? Ms. Crowley (AC): Our drama program aims to foster artistic and emotional development in our students. Skills are honed in physical and verbal communication, creative interpretation, imaginative play, and abstract thought. For me, the most important aspect of what we do is in the cultivation of empathy and global curiosity by learning to see ourselves in the lives and experiences of others. 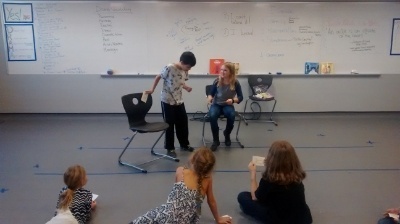 Here at BASIS Independent, the drama program works in conjunction with the other fine arts disciplines as a creative and emotional outlet for students while also posing exciting academic challenges. Ms. Simmons (ES): We build skills that are useful both on and off the stage! An experiential curriculum starts with the "Tools in the Actors Toolbox", the Voice, Body, Imagination, Concentration, Collaboration. Students build on these skills creating scenes, original plays, and one acts. How is it different than at other schools? (ES): Practically speaking, we both came to BASIS Independent with backgrounds in professional theatre (as actors, directors, and dramaturges) in addition to our work as arts educators, giving us both a wide range of resources and experiences from which to draw. We both have a background in Devising Theatre, which means that the stories and plays on stage incorporate students' own ideas and experiences. This helps create a richer experience where everyone is engaged! 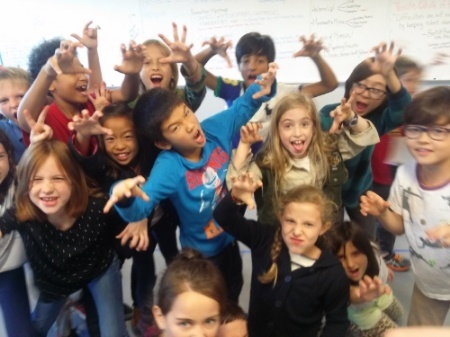 (AC): The primary difference that I see in our drama program is our broad, multi-pronged scope. Beginning in Kindergarten all the way into the high school years, drama is a present and integral aspect of the curriculum. As we are able to extend over so many grade levels, we are really able to craft a rich and comprehensive program, exposing students to aspects of the field where we would most likely not have the chance with a leaner schedule. As a teacher, it feels wonderful to have such support and confidence from BASIS Independent in the purpose and value of our subject. I feel so lucky here! Tell us a little bit about what you have going on right now. What are you up to both during school hours with your kids and after school? (AC): This year, I teach Kindergarten, 1st, 2nd, and 4th grade performing arts classes, as well as lead an after-school Drama Club of 4th and 5th grade students. 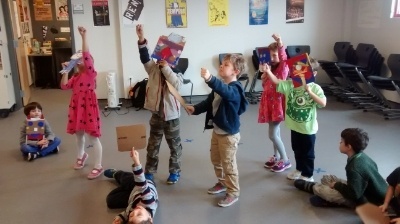 In the early grades, I do a lot of work with ‘Storydrama’, - a technique in which students engage with vivid and dynamic storybooks via dramatic activities, investigation of character, place, action, objective, etc. This process is especially good at guiding students into habits of critical reading (ex. Why are these characters the way that they are? What would you have done in their shoes? What do we know and what don’t we know about their lives? etc.) while allowing their imaginations to run wild within the worlds we encounter. It is very fun. In 4th grade, we are exploring skills of stagecraft, acting, and text analysis more formally. They are currently working on their first performance pieces of the year – one tackling James and the Giant Peach, and the other taking on Charlie and the Chocolate Factory. The students will be actors on the project, of course, but are also working as part of production design teams. Each team is responsible for a specific technical element, whether it’s assembling props and set pieces, designing costumes, managing sound and lighting, or keeping the whole operation running smoothly as a stage manager. The displays of teamwork have been outstanding, and I cannot wait to see what more the students come up with as we approach showtime! In the spring, the 4th graders will move into their Shakespeare unit, which will be very exciting. We will discuss the Renaissance as a moment in Western theatre history, Shakespeare’s life and work, learn about the mechanics of his language (scansion, meter, verse, rhyme, etc.) and perform a version of one of the plays. I couldn’t be more excited to explore this material with the students! (ES): I teach 3rd grade this year as well as the middle/high school Drama Elective. The 3rd grade is rehearsing Little Red Riding Hood with a twist! Working collaboratively between all of the 3rd grade classes, students are acting out the classic story, and then writing and performing their own versions, set in Outer Space and Prehistoric Times. The 6th/7th/8th and 9th grade Drama Electives will come together to perform the Selfish Giant: a Night of Oscar Wilde on Dec. 10 at 6:00 PM. Each Elective has a special part they are rehearsing in preparation for the night, including dramaturgey, Acting, and Design. 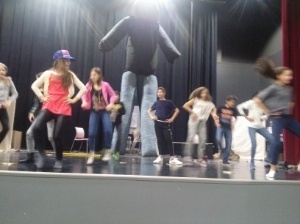 Recently the 7th grade practiced their choreography and puppetry skills for the show. We're starting to really dig deep in the upper grades! Do you see any interplay between what you do in your class and the other courses our students are taking? (ES): Yes! We did our Greek Chorus project in the 6th grade and almost the whole student audience was studying Greek Mythology at the time. In the 7th/8th/9th, we are collaborating with the engineering and physics teachers to create the Giant puppet. Theatre has so much integration possibility with other subjects, and students are excited to see those collaborations come to life. (AC): Absolutely! Ms. Simmons and I both make efforts whenever possible to coordinate the texts we use, vocabulary we employ, and themes we encounter with our students’ other subjects. 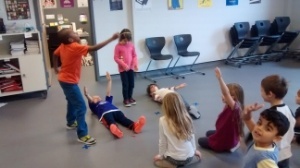 My 1st graders were recently surprised to enter my classroom to find the cardboard masks they had made in Ms. Hannan’s art class laid out on the floor for use in a physical theatre lesson, which was great fun. I have also had students approach me with ideas for performance projects based on the books they are reading in English class, and events and time periods they are studying in history and classics. Do you have any favorite stories? (ES): The 3rd grade writing their Fractured Fairy Tales have been awesome. Students are really excited about bringing in props for Little Red Riding Hood, and in writing their ideas for Outer Space Little Red Riding Hood, I have several of them coming up with some creative out-of-the-box ideas like moon rocks instead of cookies for grandma! (AC): Too many to count! A favorite quote from a 4th grader - “In performing arts, I feel like myself!” It doesn’t get much better than that! We invite you to take a look at more pictures of performing arts at BASIS Independent Brooklyn on our Facebook page.